After this weekend there will be two more before election day. Last weekend we covered the maps of electoral trends, which leaves us with the seat run-downs and pendulum to discuss. It might seem like a good idea to dedicate this weekend to one, next weekend to the other and the final weekend to formalising predictions. However, next weekend I will be providing summaries of each Legislative Council party. While this is not useful in regards to predicting electoral outcomes I personally believe it is one of the most important subjects I cover on this blog since it helps people make informed above- or below-the-line votes, provides links to each parties website and just generally makes the whole process easier. I know I had a few of my non-regular readers visit my blog exclusively for those summaries. Notice that the above pendulum is sorted alphabetically instead of by margin or party? You won't see a pendulum like that from anyone who actually knows what they are doing. Here, however, it is useful because we can directly cross reference the pendulum seat-by-seat with our other tools. However, for the purists or those more visually inclined, here is the same information of a Liberal-Labor scale. The Independents have been included with the Liberals on this scale for several reasons. Firstly, their margins are all measured against the Libs, so the Labor party is well down in a 3-horse race. Secondly, the Independents are conservative, suggesting that a lot of their votes would flow to the Libs if they did not run. This means that the Labor vote in these seats is not necessarily low because would-be Labor voters were seduced by the lure of an Independent (although it is a fair be that a lot of the Labor vote flowed to the Independents rather than the Libs and probably cost the Coalition the seat. Thirdly, in a hung parliament, it is expected the Independents would side with the Liberal Party to form government. Although the Labor Party has more seats (and hence is currently in power), the Liberals fewer marginal seats: 3 (and an Independent) compared with Labor's 11. The Liberals only have one fairly safe seat (and an Independent) compared to Labor's 4, and while Labor has 11 safe seats the Liberals have 10, plus 1 Independent and 4 in the very safe category which Labor failed to reach. If the Liberals won all of Labor's marginals, they would hold 29 seats with 3 Independents by their side; if Labor won all of the Liberal marginals they would hold 29 seats with 3 Independents against them. Assuming a uniform swing and support from the Independents, the Liberals need a 0.6% swing in their favour (which, if repeated in the Independent contest in Mount Gambier would also win them that seat. Even without the support of the greys, Steven Marshall would form a government on the back of a uniform 2.6% swing. Whether or not they will get this swing, of course, remains to be seen. Swings, of course, are not uniform, although the search for a reliable indicator of where they will be stronger or weaker continues to allude me. Instead we are going to have to rely on seats being “Labor seats” and “Liberal seats” to calculate which seats are most open to being targeted. Previous analysis indicates that a seat that has a large swing one election might have a small swing the next, so such definitions can only be a rough guide at best. Previously for the run downs I interpreted each seat on two factors – how strongly it supported a party (its “strength”) and how reliable that support was (its “volatility”). The former was subjectively assigned as very safe, safe or leaning, while the latter was intuitively divided into stable, variable and volatile. These assignments were based on the incumbency and margin (provided above in the pendulum) and the seat's history outlined last weekend. One additional factor used in the federal election – the state seats that lie within the federal seats – cannot be replicated at the state level. This election we are going to try something different. For the purposes of making the results repeatable, consistent and measurable, these run downs will rely on more rigid definitions. The VDTAs are useful for examining recent voting trends. The run downs attempt to identify long-term biases in seats. For this reason, historical inclination will be determined from the number of times a party has won the seat but lost the election – that is, where the seat's preferences are revealed to be skewed to one party or another relative to the state as a whole. For simplicity we have ignored Independents. The contrary count is the number of times the seat has been won by a party that lost the election. Adelaide has voted for the ALP 11 times when the Coalition has gone on to win the election, which initially suggests this is a decent seat for Labor. The In Step table shows how many times the seat has been won by the party that also won the election. This is useful because it lets us total the number of times a party has won the seat; realising that Playford has voted for the ALP 4 times in Coalition victories is somewhat meaningless until we also realise it has never voted for the Coalition. The final table is calculated to show the percentage of times the ALP has won Coalition elections and vice versa. In Adelaide, Labor won the seat in 11 of the 12 Coalition-won elections (91.7%) and the Coalition won Adelaide in 3 of the 10 Labor elections (30%) since 1938. ALP data fro Little Para cannot be calculated because it has never participated in a Coalition-won election. 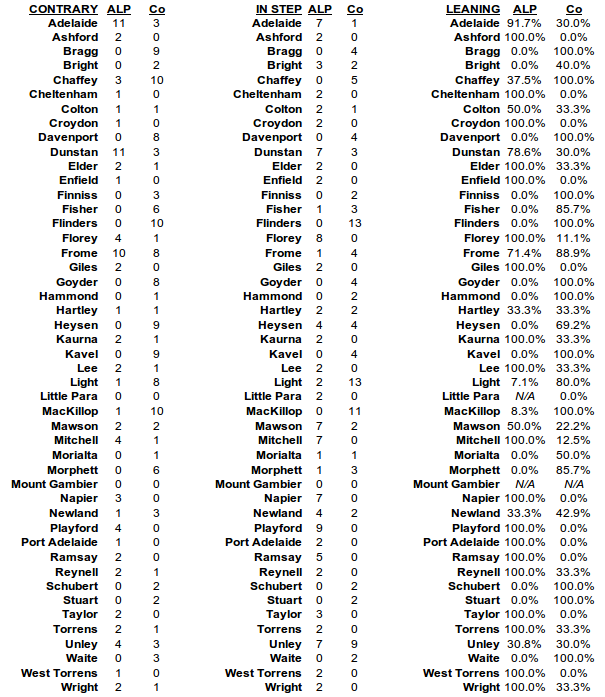 No figures for Mount Gambier can be calculated since it has always elected an Independent. Let's calculate the liability of each seat to favour a given party from the difference between these last figures. To continue to use Adelaide as an example, lets say the seat is 91.7 – 30 = 61.7% leaning to the ALP. 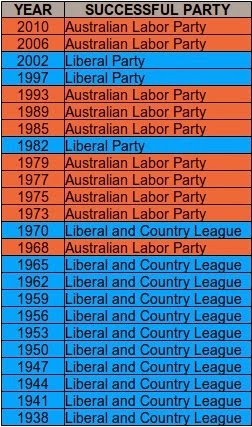 Like most of the dramatic ALP leans, this is mostly historical, with a large opposition to the Coalition dominance prior to 1965 under the Playford-favouring Gerrymander creatively known as the Playmander. However lets leave the concerns about recent vs ancient trends to be picked up by the VDTAs and use this (admittedly arbitrarily calculated) figure for a ballpark and see what we can kick around. On face value it looks as though the ALP has the slight majority in an even battle, but the Coalition only needs to break into the Labor Leaning seats to take a majority. Colton, Hartley, Mawson and Unley are seats to watch. Particularly Unley – a recurring oddball. By and large this data conforms with the current state of the seats, which suggests a decent predictive power. Ignoring the unknowns (Little Para is Labor while Mount Gambier is Independent) and the Liberal-leaning Independents (Frome and Fisher are still listed as Liberal seats), there are only 3 seats from each party that have a supposed bias contrary to their current incumbent – Adelaide, Dunstan and Unley are currently Liberal while Bright, Light and Newland are currently Labor. These, again, will be worth watching. Again, particularly Unley. Finally their historical inclination calculated here also closely correlate with the VDTA. 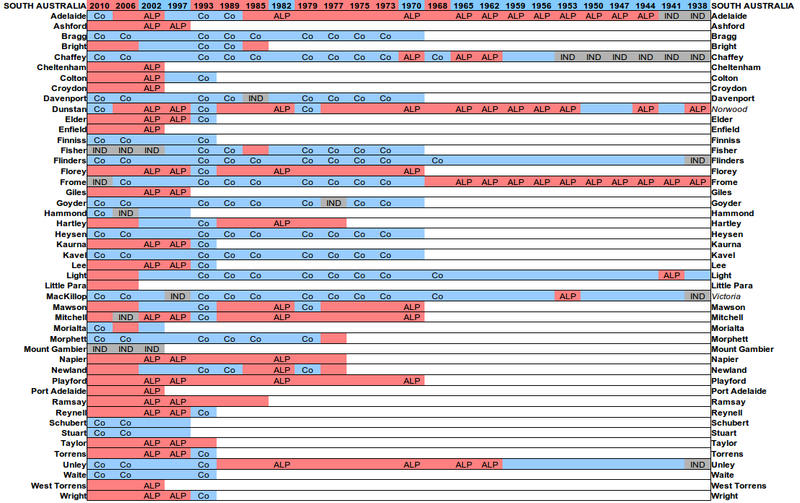 All of the clear Liberal or Labor seats on the VDTA correspond with Liberal or Labor seats from today's data, with the single exception of the oddball Unley (again!) which is historically safe Liberal on the VDTA but leaning Labor here. Note that these last three – Bright, Light and Newland – are the three peculiarities listed above as Labor occupied but (by this post's reckoning) Liberal inclined. Either today's analysis has failed to capture a recent development in these seats, or the atypical Labor incumbency has biased the VDTA. All have passed to Labor for the last two elections after at least 4 wins by the Coalition, which could support either interpretation. Either way, in the wider view, all of our methods are starting to align nicely.